Doors Open at 5:30. Show at 7 PM. 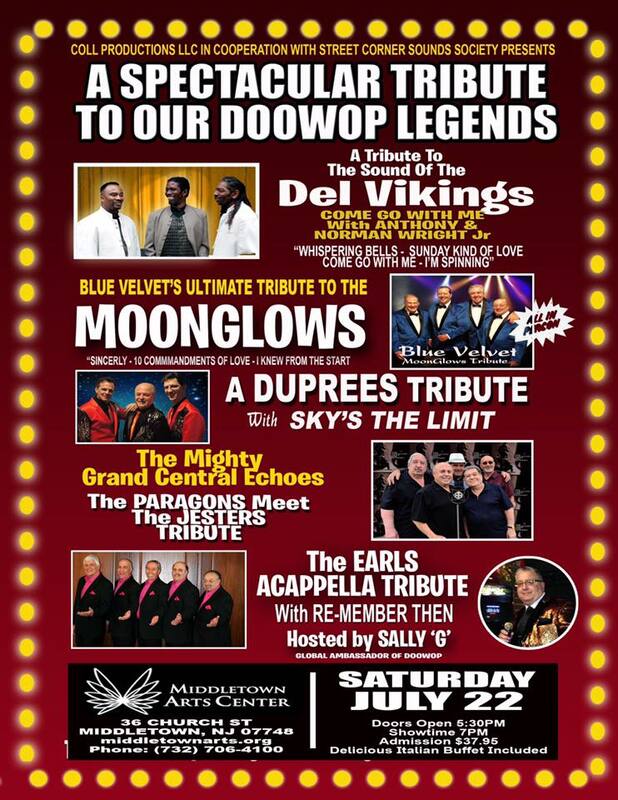 On Saturday July 22, Coll Productions in cooperation with the Street Corner Sounds Society will present A Spectacular Tribute to Our Doo Wop Legends, featuring A Tribute to the Sound of the Del Vikings (featuring Anthony & Norman Wright Jr, sons of Del Viking member Norman Wright); Blue Velvet’s Ultimate Tribute to the Moonglows; A Duprees Tribute with Sky’s The Limit; The mighty Grand Central Echoes with a tribute to the Paragons and Jesters; and Re-MemberThen’s Tribute to The Earls. Also featuring Johnny T. Hosted by Sally G. It all takes place at the Middletown Arts Center, 36 Church Street, Middletown, NJ 07748. Italian buffet included. Admission is $37.95. Doors open at 5:30 pm, show time at 7. Call 732-706-4100 for info or reservations.